Original building built in 1550 as the "Shippe" and later the "Spread Eagle" - in 1746 there was a Spread Eagle Court opposite the pub. Destroyed by fire in the 1800's, rebuilt as a single story pub and named the "Spread Eagle and Crown". 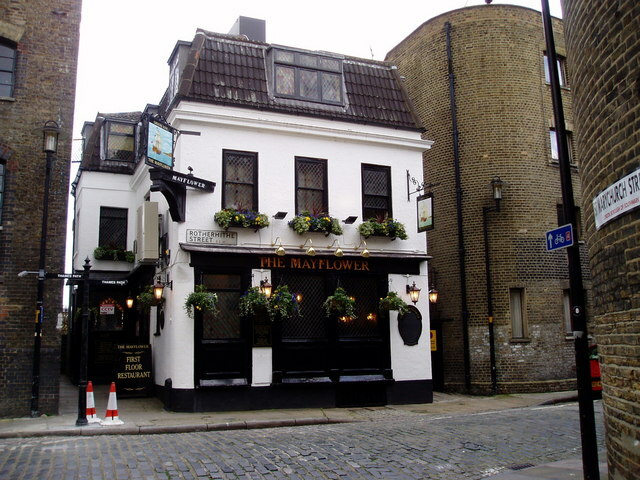 Much later renamed the "Mayflower" in memory of Captain Jones, 1st mate John Clarke and 2nd mate John Moore - as it was (so it's said) near the spot where they left to join the Mayflower Ship at Southampton. In the 1960's and possibly later, it was the only pub allowed to sell postage stamps that were nicknamed "Double Eagles" and "Old Mother Red Nose". From 1746 to 1985, Rotherhithe could boast of about 145 pubs - "about" as some names were no doubt "re-names" of a pub. © Copyright Chris Lordan and licensed for reuse under this Creative Commons Licence. This page has been viewed about 814 times. TQ3579 : King George's Fields - Lower Road, Rotherhithe, SE16 TQ3579 : King George's Fields - Lower Road, Rotherhithe, SE16 King George's Park is the site of All Saint's Church (demolition date unknown).